Karl Pärsimägi perished at the hands of the Nazis when he was only 40 years old, yet primarily for the body of work that he completed in the 1930’s, he is often named as one of the most sensitive and at the same time bold artists in Estonian art in terms of his use of colour. He had begun his studies at the Pallas school at the age of 17 already and during the subsequent decades, he evolved into a modernist who first and foremost stressed the intrinsic values of colour itself, for which reason he has also been called Estonia’s Matisse. His work ranged from nudes to portraits, from paintings of interiors to views of landscapes. Pärsimägi went to Paris in 1937 and since he did not leave the city in time after the Second World War broke out, he was arrested and executed in a concentration camp. The interior of a room in a farmhouse in which a woman currently happens to be is a frequently occurring motif in Karl Pärsimägi’s creative work. 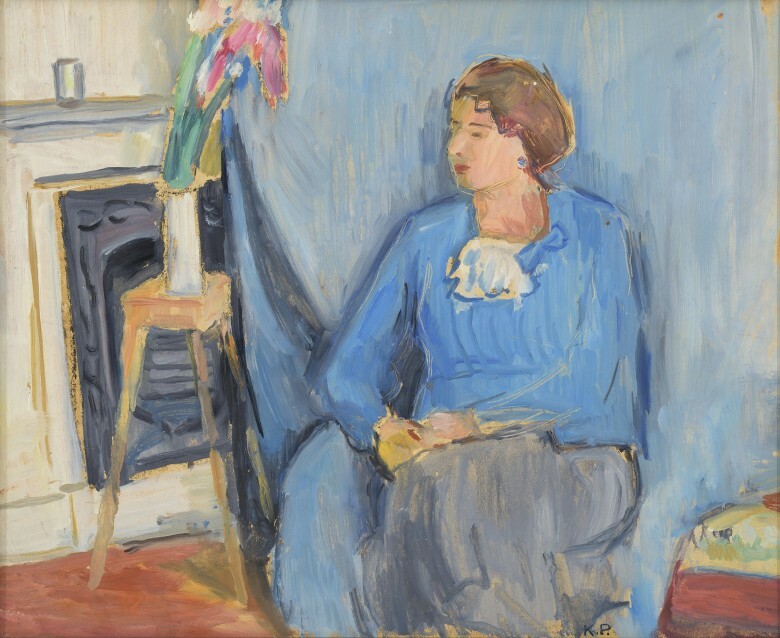 We notice several “homelike” objects in the painting Woman in the Living Room as well that create a secure and warm atmosphere: a cooking stove with an iron door, a little stool, a flower vase with flowers. The woman, however, leaves us with the impression of being a modern, independent woman in this environment, and her ladylike elegance is even in a kind of contrast with the domestic milieu. 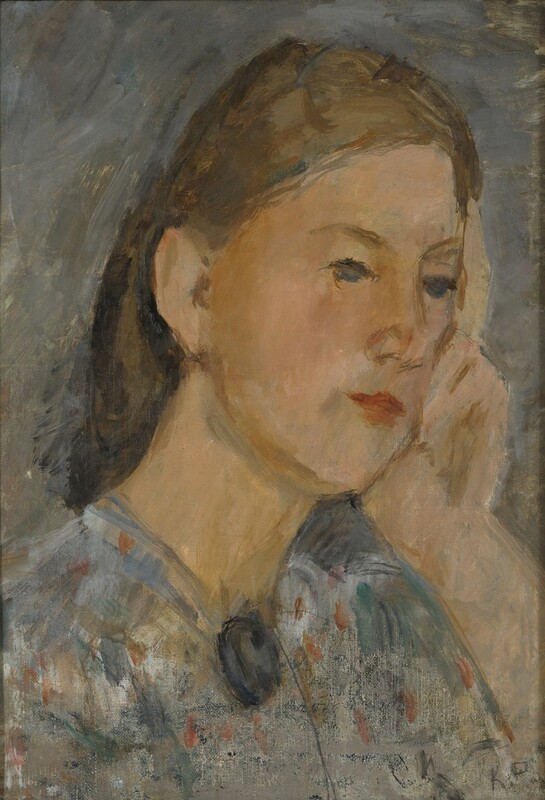 It is also interesting to note the drapery that forms the background for the woman – in the 20th century, many modernists used some sort of background cloth in depicting their models, but as a rule, that background was painted as being variegated (compare with Konrad Mägi for example). Pärsimägi, who preferred surfaces of single, clean colours, uses a uniformly blue drapery, which covers nearly half of the overall surface area of the painting. Karl Pärsimägi has also been categorised as a fauvist because he loved pure and powerful colour surfaces. Pärsimägi preferred clear, large areas of colour over details. Thus we also see sharp contrast between the blue sky and the red roof of the house in this work. In the interests of the harmony of colours in this painting, a boat with a red bottom has been painted to go with the red roof, so that the two of them form an interesting pair of colours. The lower right-hand corner of the painting, on the other hand, is a battleground of various colours, where instead of surfaces, Pärsimägi has placed colours alongside each other as stripes and lines. 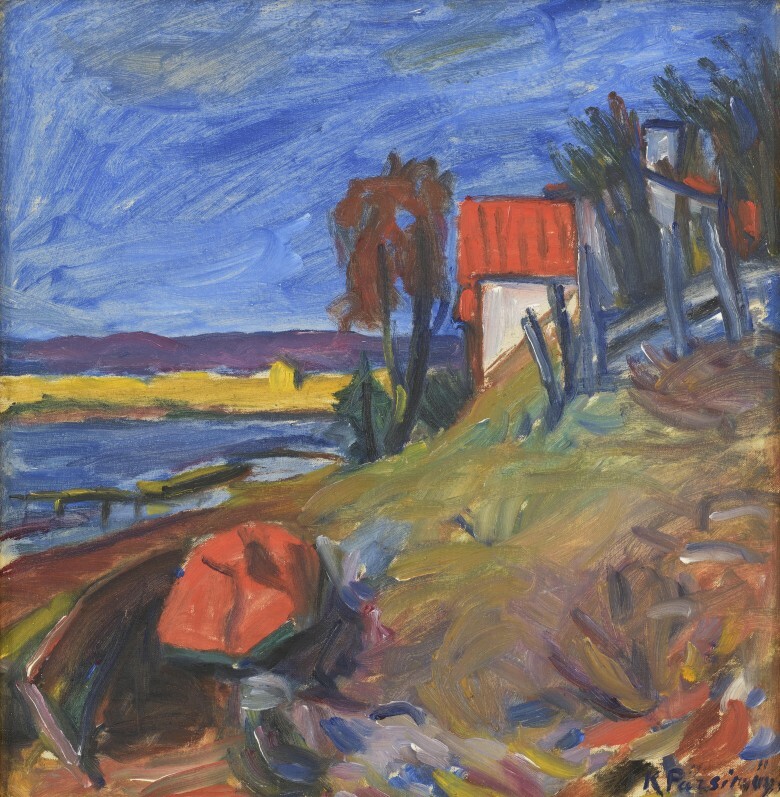 Pärsimägi was an acclaimed artist in the 1930’s. His paintings were rich in colour and attracted a great deal of attention. The subject of this painting is not surprising in this case: Pärsimägi often depicted women in reflective poses whose facial features become indistinct in the surrounding interior. Pärsimägi was in Estonia for the last time in 1936 since he left for Paris the following year and never returned from there.